Blue Bird Logistics and Packers Movers is one of the leading Car Transportation Service Providing Company in Baroda having an expertise in the car transportation service. Blue Bird Logistics and Packers Movers is efficient in transporting your valuable car to anywhere in India. Blue Bird Logistics and Packers Movers in Baroda are well known in the market for providing safe and on time delivery of cars to any destination in India. Our Car Transporation by Car Carrier Services are designed and drafted as per the customer's specifications, which has helped us earn an impressive list of clients. Our company offers professional car Carrier services and offers to our clients personalized car transportation services at competitive prices. Our door to door service starts from the car getting picked up and ends at its delivery at the destination point. The expert handlers are well adapted and have the expertise concerning all loading and relocation processes. Blue Bird Logistics and Packers Movers offers carrier services for all category of car large or small from all destination position to any destination position across India. Transporting a car can refer a numerate of risks but not when you involve our services. Transporting your car is now a comfortable task, and your precious car will not receive any damages. 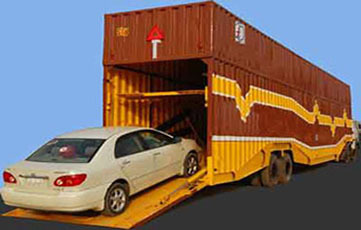 Our knowledge in the industry has made us professional in providing car carrier services to our customers. Blue Bird Logistics and Packers Movers in Baroda has own car carriers so that your cars can be touched easily without having to depend on hiring other companies to support the car carrier vehicles. Blue Bird Logistics and Packers Movers in Baroda make sure that car should be overloaded to the carrier with carefully and reach to objective in container by Blue Bird Logistics and Packers Movers Relocation with zero percent nervousness to consumer. Well-timed and safe delivery of your car at your doorway is our specialty and you can trustingness us to provide you with overwhelming services at a price that suits your pocket. Before the car is moved, it is enclosed with special car covering material so that it does not get any scratches and dents. Lorries are used to bring the car and to transfer your car to the motor truck, we make use of the clinchers so that your car does not get destroyed and is transported safely. Blue Bird Logistics and Packers Movers hires knowledge drivers and bearing staffs for car relocation service leaving no breathing space of risk at the time of loading car to carrier consumer for transporting it to the consumer residence from ramp spot. We at HS Packers Movers Logistics / Blue Bird Logistics and Packers Movers in Baroda offer car shifting service with all worry keeping in mind customer time and value. The Service Provider like Packing and Moving Services, Household Goods Shifitng Services, Office Relocation Services, Car relocation service in Baroda with greatest carrier facility of all exclusive and luxuries Car to all over India by taking responsibility of your car delivery without any deform and scratches. Blue Bird Logistics and Packers Movers also act as a necessary character in transporting your car from your door to destination residence.